Last week Jan had a very bad cold. Copious sneezing,aches and a very runny nose. Fortunately she managed to give it away… to me. Too much tongue I think! What we have been waiting for is some visitors so I can give it away. Unfortunately that hasn’t happened, so I took a walk to Tring this morning and gave 90% of it to strangers! I’m now feeling much better. 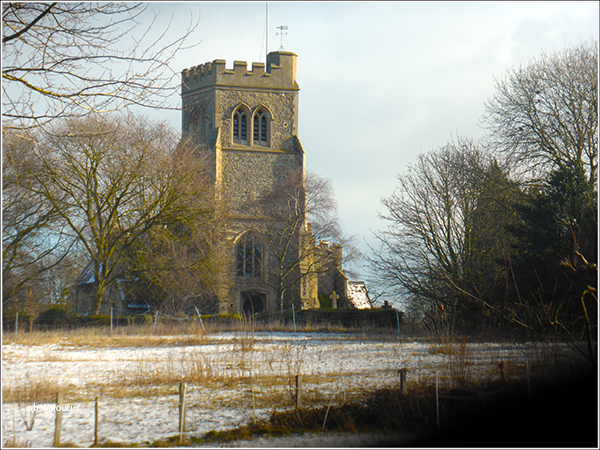 Meanwhile Jan went for a walk around Marsworth and took a few photos. The surface of the canal had refrozen overnight, albeit the ice appears to be thinner. We’ve now been here three days longer than planned so hopefully it will sufficiently melt for us to head towards Aylesbury. Why do the locks around here have to be left empty with a raised lower paddle? I would have thought there would be less water loss if they were left full along with less chance of damage (bulging) of the lock sidewalls. The top lock on the Marsworth flight is damaged and the flight is closed until repairs are carried out. 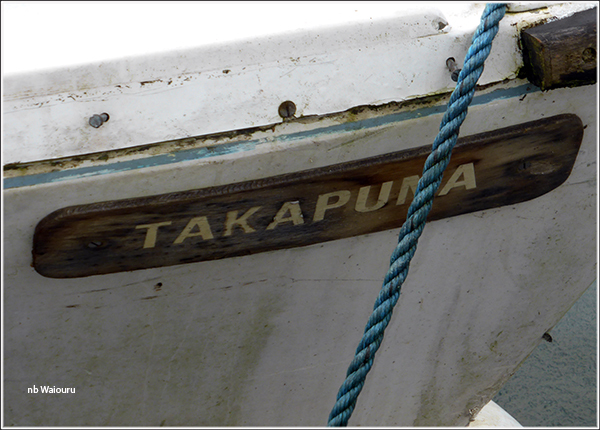 Jan noticed one of the fibreglass boats moored around the corner has a NZ maori name. Takapuna is a suburb on Auckland City’s north shore. I worked there for two years and as a boy lived on the north shore for the same period. It’s a very attractive location. Meanwhile Jan had her ice breakers out working around the boat and in the middle of the junction. ooow…. this water is cold! Just before dusk there was a terrible crashing sound that had us racing to the windows portholes to see what had happened. The steerer in nb Nobility was reversing through the ice in the junction. 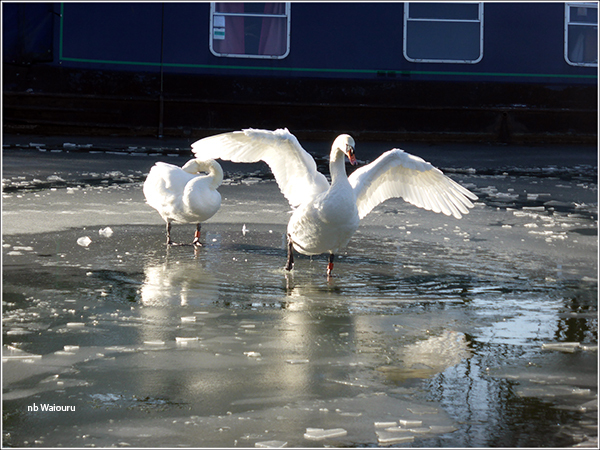 Initially he had some speed (an area of ice broken by Jan’s swans) but when he hit the solid ice the boat came to a stop. He had to go forward and then reverse several times to make it to the facilities mooring. 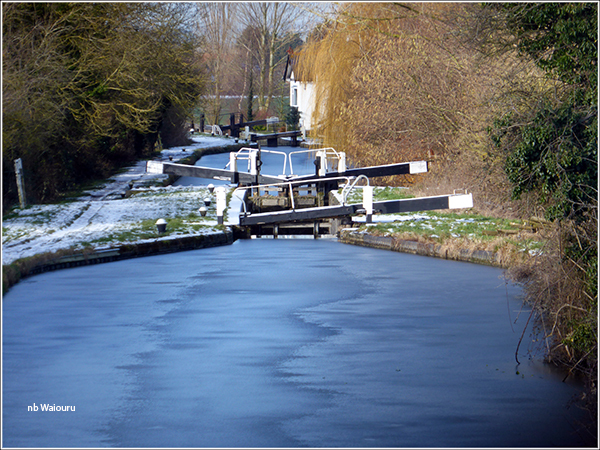 If you are going to get trapped in the ice then it’s probably the best mooring in Marsworth. Sorry I still have not got myself sorted to post direct to your blog. You will encounter a number of locks, on your way to London, where you are asked to leave the lock empty. I am not sure whether it applies to all of them, but I was told that it was due to leakage from the side walls allowing water to get into the basement of adjoining properties – presumably, in most cases, old keeper’s cottages. Unfortunately a number of boaters interpret this instruction as leave the gate open as they go down, rather than just leave a paddle up. Incidentally, if you go up the Lea and Stort, you will find from Carthagena Lock forward and up the Stort that it is local practice to leave gates open on exit. The Stort locks are unique in that they are wide, but will not take two narrowboats. You still have to open two gates. Hope this is helpful. Enjoy the Aylesbury. Not sure what it is like this time of the year, but when we ventured down parts of it resembled a journey on the African Queen. You could almost hear the drumbeats through the reeds. In addition to John’s comments; they also leave a paddle up on the bottom gates where there are leaky top gates, there is more water pressure on the top gates helping to keep them tightly closed. That makes sense George. But why not everywhere? We have been in the southlands since the beginning of December. It seems to be pretty much the norm here to not bother shutting up shop behind you when leaving a lock. We have not joined in with this practice. We are now heading back north (should be in Hemel Hempstead tomorrow) and will probably pass you in a week or two, ice and Marsworth permitting. Leaving locks empty: Sometimes it’s leaking gates, as others have mentioned. Often it’s leaking walls where the grouting has failed and water is leaking into the bank behind. A small trickle of water gradually increases over time and washes away the bank behind the wall and a hole forms, followed by collapse if not dealt with. Leaving the locks empty minimises the erosion until it reaches sufficient urgency to appear in the winter stoppages. Where there is a house alongside the lock, as there appears to be in your second picture, the leaking water can flow into the building and turn their basement into a swimming pool. While you have one of these marked locks filled when passing through you can look around and sometimes see a considerable flow of water appearing where it shouldn’t until you empty the lock again.